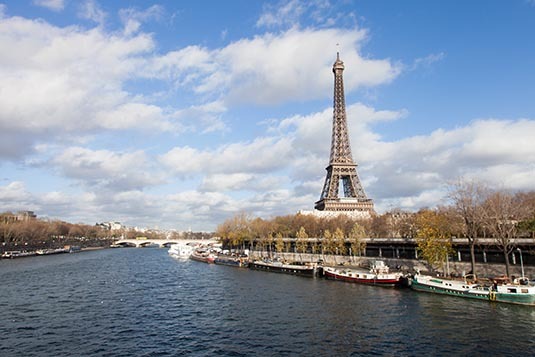 Located in the north of the country on the river Seine, Paris has the reputation of being the most beautiful and romantic of all cities, brimming with historic associations and remaining vastly influential in the realms of culture, art, fashion, food and design. Dubbed as the City of Light (La Ville Lumiere) and Capital of Fashion, it is home to the world's finest and most luxurious fashion designers and cosmetics, such as Chanel, Christian Dior, Yves Saint-Laurent, Guerlain, Lancome, L'Oreal, Clarins and the likes. Paris has the second highest number of Michelin-restaurants in the world; the first being Tokyo. I landed at Paris CDG airport on a chilly November night. At 10:45PM it was well past the time when the last of the bus shuttles left the airport for the city hotels. Though the trains to city do run up to 1:30 in the morning, I decided to take the taxi – thought it would be faster and safe. Generally, a taxi ride to the city would cost EUR 50. However, I ended up paying EUR 75 as there was a traffic snarl on the highway due to an accident. Tough luck. 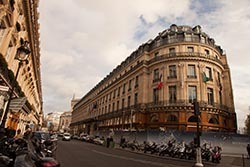 I was booked at Hotel Concorde Montparnasse on Rue Du Commandant Mouchotte. It’s a nice business hotel. By the time I was in my room it was almost midnight. There was no other option than to crash for the night. From my window I could see the illuminated Eiffel Tower. Even the city of lights was unable to keep me awake after the long journey from home. The best way to explore Paris is on foot. Of course, you should be prepared for extended walks and it is well worth the effort. The city of Paris is officially divided into 20 districts called arrondissement. They are numbered from 1 to 20 in a clockwise spiral from the centre of the city (which is known as Kilometre Zero and is located in the front of Notre Dame – a location from where Paris evolved to its present grandeur. 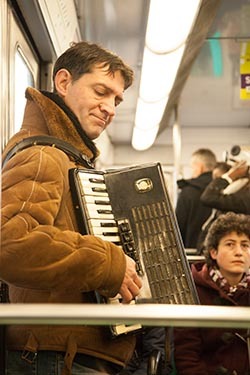 Paris offers extensive and efficient public transportation. A combination of underground trains and buses can easily take you from anywhere to anywhere in and the suburbs of Paris. There are 16 Metro Lines and 5 Suburban Lines (called RER) that zig-zag below the city. Make it a point to get a city map. Almost all hotels would offer one free of cost. A single ride on the train or bus costs EUR 1.70. The distance doesn’t really matter as long as the journey is limited to 90 minutes. Depending on your travel plans, you could decide various ticket (called billet) options. A single journey; or a pack of 10 tickets for about EUR 12; a day pass or a multi-day pass. I opted to buy single tickets as and when required. In hind sight a pack of 10 tickets would have been a better idea. After breakfast the next morning I walked to Gare Montparnasse which was quite near to my hotel. Gare means Station. There are 6 major stations in Paris. And of course hundreds of Metro and RER stations all along Paris boulevards and streets. In case you get lost just keeping walking. A Metro / RER station will set your bearings in the right directions. From Gare Montparnasse I boarded Metro No 6 and alighted at Charles de Gaulle Etoile and came up just opposite to Arc De Triomphe. This monument is on one end of the famous Paris road named Avenue Des Champ Elysees. My exploration of the city would commence from here. I would walk all the way down to Notre Dame with detours to many of the cross streets (and bridges) that are home to famous Paris icons. It was 9AM when I commenced walking. The exploration took me along Rond Point; Theatre Marigny; Grand Palais; Petit Palais; Pont (Bridge) Alexandre III over the Seine River; Des Invalides; Museum De Larmee; Place De La Concorde; Obelisque; Palais Bourbon; Jardin Des Tuileries; Arc Du Carrousel and Museum De Louvre. 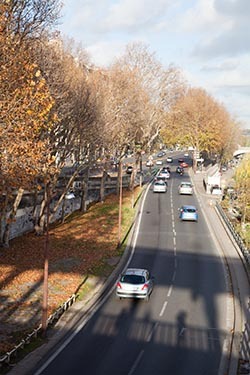 According to a much used description, the 2-km long Champs Elysees is a "la plus belle avenue du monde" meaning, "the most beautiful avenue in the world". 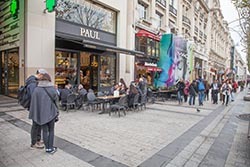 With its cinemas, cafes, luxury specialty shops and clipped horse-chestnut trees, the Champs Elysees is arguably the most famous street, and, one of the most expensive strips of real estate in the world. 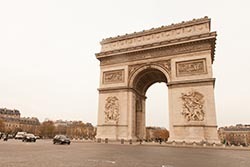 Ordered by Napoleon as a memorial to the French Grand Army, the triumphal arch was begun by the architect Chalgrin in 1806 and completed in 1836. The Arc de Triomphe is built on the model of ancient Triumphal Arches, but its monumental size: 50 meters tall and 45 meters wide, is typical of the Empire architecture. This arch offers a great whole of sculptures, the best known is a bas relief of Rude, depicting "the departure of the volunteers in 1792", also called the Marseillaise. The avenue was all decked up with Christmas being just round the corner. Stalls and kiosks selling foodstuffs, curios, souvenirs, fashion trinkets and sorts were donning the Rond Point area. The Grand Palais (Palace) was built by Daglone and Louvet, between 1897 and 1900, for the World's Fair. Its large metallic hall is typical of the Art Nouveau whereas the stone facade with ionic columns is in Academic style. At the corners, in the top of the building rush the bronzes groups of Recipon. The Grand Palais is home to many temporary world famous exhibitions. Because this is not too crowded, Petit Palais is a nice place ideal for people who look for refuge and relaxation. The museum offers an exposition of magnificent patchwork of many including Delacroix, Courbet and Ingres. 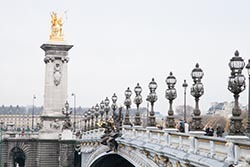 With its many sculptured decorations and its unique arch that spans the Seine in one go, Pont Alexandre III is the most elegant bridge in Paris. Sculptures of nymphs depicture the respective rivers of the 2 nations: the Seine and the Neva. In 1896, the Tsar Alexandre III put the first stone of the bridge which was completed in 2 years thereafter. Les Invalides, officially known as L'Hotel National Des Invalides (The National Residence of the Invalids), is a complex of buildings in the 7th arrondissement containing museums and monuments, all relating to the military history of France, as well as a hospital and a retirement home for war veterans, the building's original purpose. The buildings house many museums and are also the burial site for some of France's war heroes, notably Napoleon Bonaparte. 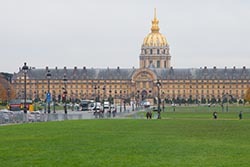 At 20 acres, the octagonal Place de la Concorde is the largest square in Paris. 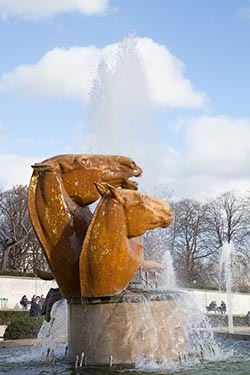 It is situated between the Tuileries and the Champs Elysees. In 1763, a large statue of King Louis XV was erected at the site to celebrate the recovery of the king after a serious illness. The square surrounding the statue was created later in the year 1772 by the architect Jacques-Ange Gabriel. It was known as the Place Louis XV. In 1792, during the French revolution, the statue was replaced by another large statue, called 'Liberte' (freedom) and the square was called Place de la Revolution. A guillotine was installed at the center of the square and in a time span of only a couple of years, 1119 people were beheaded here. Amongst them were many famous people including King Louis XVI, Marie-Antionette and Robespierre. 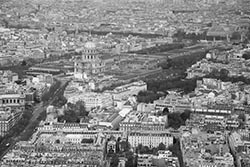 After the revolution the square was renamed several times until 1830, when it was given the current name Place de la Concorde. 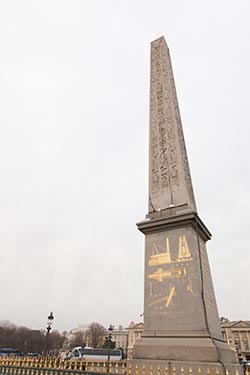 In the 19th century the 3200 years old Obelisque (Obelisk) from the temple of Ramses II at Thebes was installed at the center of the Place de la Concorde. It is a 23 meters tall monolith in pink. Obelisk's pedestal is made of granite and weighs approximately 230 tons. In 1831, it was offered by the Viceroy of Egypt to Louis Philippe. Three obelisks were offered by the Viceroy, but only one was transported to Paris. The obelisk - sometimes dubbed 'L'aiguille de Cleopatre' or Cleopatra's Needle - is covered with hieroglyphs picturing the reign of Pharaohs. 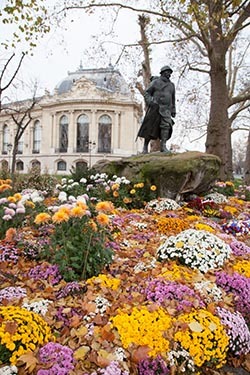 At each corner of the octagonal square is a statue representing a French city, namely, Bordeaux, Brest, Lille, Lyon, Marseille, Nantes, Rouen and Strasbourg. They were installed in 1836 by Jacob Ignaz Hittorf, who redesigned the Place de la Concorde between 1833 and 1846. That same year a bronze fountain, called 'La Fontaine Des Mers' was added to the square. A second one, the 'Elevation of the Maritime' fountain, was installed in 1839. The Palais Bourbon is a palace located on the left bank of the Seine, across from the Place de la Concorde, is the seat of the French National Assembly, the lower legislative chamber of the French government. The Jardin des Tuileries is one of Paris's most visited gardens thanks to its central location between the Louvre and Place de la Concorde. 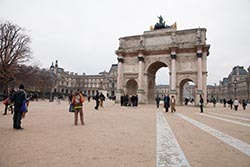 As such the Tuileries is part of a grand central axis leading from the Louvre all the way to La Defense, the city's business district. In the early 16th century the area was a clay quarry for tiles (tuilerie in French, hence the name). After the death of her husband Henri II in 1559, Catherine de Medicis had a Palace built at the tuileries, the Palais de Tuileries. The palace featured a large garden in Italian style, reminding her of her native Tuscany. Between 1660 and 1664 the garden was redesigned in French formal style by Andre Le Notre, the celebrated gardener of the Sun King, best known for his design of the gardens at the Versailles Palace. Le Notre built a terrace along the riverbank and opened up a central axis which he extended three years later with the creation of the Champs Elysees. The garden features several fountains, two large basins, numerous sculptures and two museums, the Galerie Nationale du Jeu de Paume and the Musee de l'Orangerie, which displays Claude Monet's large water lily paintings. The Arc de Triomphe du Carrousel is a triumphal arch in Paris, located in the Place du Carrousel on the site of the former Tuileries Palace. It was built between 1806 and 1808 to commemorate Napoleon's military victories. I walked through this arch to enter Louvre. The Louvre, originally a royal palace but now the world's most famous museum, is a must visit when in Paris. The collection of the Louvre Museum was first established in the 16th century as the private collection of King Francis I. 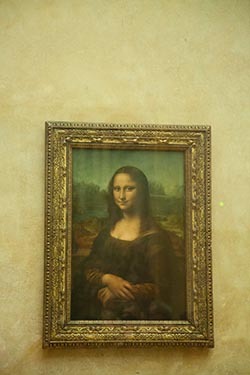 One of the works of art he purchased was the now famous Mona Lisa painting. The collection grew steadily thanks to donations and purchases by the kings. In 1793, during the French Revolution, the Louvre became a national art museum and the private royal collection opened to the public. The museum has a collection of over 1 million works of art, of which about 35,000 are on display, spread out over three wings of the former palace, namely Sully, Richelieu and Denon. The museum has a diverse collection ranging from the Antiquity up to the mid 19th century. 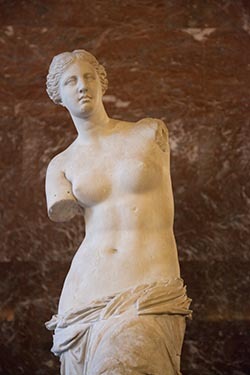 Some of the most famous works of art in the museum are the Venus of Milo, the Nike of Samothrake, the Dying Slave by Michelangelo and of course Leonardo da Vinci's Mona Lisa. Art lovers would spend days in this one museum alone. However, tourists like me on a time-budget will have to run through the famous exhibits in a few hours. Please expect long lines to get in. Speaking of queues, be well aware that Paris is an extremely popular tourist destination. Unless you have purchased entry tickets online or beforehand, you will be spending lot of time standing in lines. I was in Paris in November yet there were zillions of tourists. In summers, which would be the peak season, expect a wee bit more. Just so you know, I dropped the idea of going up the Eiffel Tower simply because I had no time on hand. 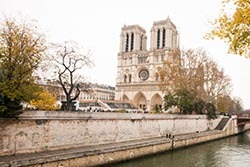 From Louvre, I crossed over the Seine again and walked along the river bank negotiating on my way the Institute of France, Fontaine Saint Michel and finally the Notre Dame. 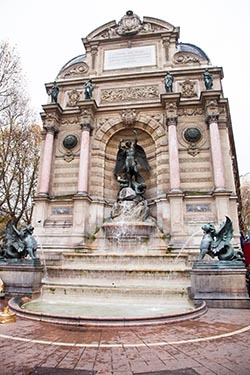 The Fontaine Saint-Michel is a monumental fountain located in Place Saint Michel in the 5th arrondissement. It was constructed in 1858-1860 during the French Second Empire by the architect Gabriel Davioud. I had my lunch at Subway near the fountain. Notre Dame de Paris in French means "Our Lady of Paris". It is a historic Roman Catholic Marian cathedral in the 4th arrondissement. The monument is widely considered as one of the finest examples of French Gothic architecture and among the largest and most well-known churches in the world ever built. The cathedral treasury is notable for its reliquary, which houses the purported crown of thorns, a fragment of the True Cross and one of the Holy Nails – all instruments of the Passion and a few of the most important first-class relics. Notre Dame de Paris is often reputed to be one of the most prominent examples of Gothic architecture. Entrance to Notre Dame is free of cost. Visitors can climb up the cathedral to get a great view of Paris below. However, I skipped the idea for 2 reasons – one, long line and two, I didn’t have the energy to climb hundreds of steps! From Notre Dame I walked to Chatlet metro station, which is just across Tour (Tower) Saint Jacques. By the time I reached my hotel it was 6:30PM. I was waiting for the clock to strike 7. That’s when the Eiffel Tower would shimmer with scintillating lights for 5 minutes. This happens every evening on the hour till midnight. I had walked for about 9 hours. A good night’s rest was well deserved. Tomorrow, I had plans to visit Versailles. After spending half a day in Versailles, I returned to Paris at about 2 in the afternoon. From Gare Montparnasse I took the Metro 6 and alighted at Bir-Hakeim station. From here, it’s a good 15-minute walk to Tour Eiffel (Eiffel Tower for most of us). Finally, I was in touching distance of the most visited structure in the world! Visitors have the option to go up the Eiffel Tower. Going up would be a combination of slanting and upright elevators. Those adventurous can climb-up the stairs too. At the time of my visit, 3 gates were open. And there were long lines for buying entry tickets. As mentioned earlier, I decided to skip going up. The time I saved, helped me to explore the neighborhood and the massive steel structure from various angles. The Eiffel Tower is an iron lattice tower located on the Champ de Mars, named after the engineer Gustave Eiffel, whose company designed and built the tower. Erected in 1889 as the entrance arch to the 1889 World's Fair, it has become both a global cultural icon of France and one of the most recognizable structures in the world. The tower is the tallest structure in Paris and the most visited paid monument in the world - 7.1 million people ascended it in 2011. From Eiffel Tower, I crossed over the Seine to visit Palais Chaillot. 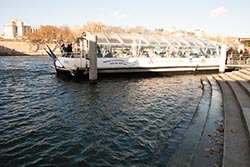 I continued my walk along the Seine on Avenue De New York till I reached Pont Bir-Hakeim. This is a beautiful bridge made of steel that helps vehicles and trains to cross the Seine. More important, from my perspective, the bridge offers a vantage point to picture the Eiffel Tower with Seine in the foreground. The first structure built on the top of the hill known as Chaillot was erected for the 1878 World's Fair. Today, the Palais de Chaillot houses a number of different museums. In the south wing, there are two - the Musee de la Marine (Naval Museum) and the Musee de l'Homme (The Museum of Man). The Theatre National de Chaillot is located below the esplanade. With 1,200 seats, it was the center of Parisian culture following World War II and is still a popular location for concerts and plays. At the foot of the terrace of the Palais de Chaillot lie the Trocadero gardens. The 10-hectare large gardens are laid out around a big rectangular pond. The fountain in the pond - the largest in Paris - is especially spectacular at night, when it is lit. I reached the hotel at 6PM. After resting for a while, I left my room at 7PM to explore Champs Elysees by the night. I was also scheduled to visit Lido – dubbed “the world’s most celebrated cabaret”. Lido and its revues have been adding dazzle to the City of Light since 1946. Lido offers shows with or without the dinner and with or without the champagne. Cost is from Euro 95 onwards. The actual show lasts for about 100 minutes. The sets, costumes and the choreography are bound to delight all. A visit to Lido has my recommendation. Sorry, I don’t have images in here as photography (for obvious reasons) is not allowed when the show’s on. I was back in my room by midnight. The next day I would leave for Annecy in the afternoon. That gave me a few hours in the morning to explore the unexplored. Just across Gare Montparnasse is the Montparnasse Towers. Visitors can visit the 56th floor of the building that offers some spectacular bird-eye views of Paris. One can climb up 3 floors and touch the sky. For those who miss climbing the Eiffel Tower must certainly go up here. Advantages are two-fold. You get to see Paris from up above and you get to see the Eiffel Tower itself! After feasting my eyes with panoramic views, I took Metro No 12 to Madeleine. From there I walked to Opera Garnier via Boulevard Des Capucines. 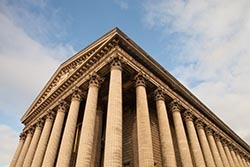 The Greek temple just north of the Place the Concorde is known as 'La Madeleine' or 'L'eglise de St. Marie Madeleine'. The large building is actually a church, dedicated to St. Mary Magdalene. In French, Magdalene is known as Madeleine, hence the name of the building. There are 52 Corinthian columns surround the temple, each of them twenty meters high. At the front, the columns are topped with a sculpted frieze. The bas reliefs on the bronze doors are by Henri de Triqueti and represent the Ten Commandments. Inside, behind the altar is a large statue depicting the ascension of Mary Magdalene. It was built in 1837 by Charles Marochetti. The opulent Opera de Paris Garnier was designed by Charles Garnier for Emperor Napoleon III. It is the most important symbol of the 19th century Second Empire baroque style. Construction of the opera building started in 1862, but it wasn't completed until 1875, partly because an underground lake was discovered during Palais Garnier construction. 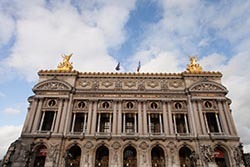 Since the construction of the modern Opera de Paris Bastille in 1989, the majestic Opera Garnier is now mainly used for ballet performances. It was also officially renamed 'Palais Opera'. Well, that was Paris for me. Back at the hotel I checked out and boarded bus No 91 that took me to Gare De Lyon via Du Montparnasse and Boulevard De Port Royal. My TGV (Train a Grande Vitesse, meaning high-speed train) would leave at 4:45PM and take me to Annecy. As scheduled I was at Annecy at 8:35PM.